The global memristors market is expected to register a CAGR of 64.5% during the forecast period of 2018-2023. The scope of the report is limited to electronics, industrial, automotive, healthcare, aerospace & defense, and IT & telecom industries. The regions considered in the scope of the report include North America, Europe, Asia-Pacific, and rest of the world. Owing to their advantages, such as compact size, capacity to retain memory without power, very small read and write timing, very high retention, enhanced endurance, and 3D design capabilities, and further being applicable in portable electronics, industrial robotics, supercomputers, servers, and data centers, memristors are expected to witness a significant growth over the forecast period. Most of the major players, such as HP and Lenovo, with respective market shares of 28.66% and 17% in the supercomputers market in 2017, are investing in the technology. With the increasing focus on innovations in these sectors, memristors are expected to be adopted at a healthy rate. Moreover, with rising automation needs across various industries, the demand for memristors is observed to be on the rise. Further, the IoT adoption trend and rising emphasis on the deployment of artificial intelligence will offer opportunities in the near future. However, high costs associated with these devices, coupled with the complexity in their manufacturing may challenge the market’s growth. Memristors have emerged as a viable and effective alternative for flash memories, thereby finding applications across various industries. The increase in the demand for automation processes across industries is expected to bolster the demand for industrial robots. These robots require flash memory with zero boot time, enhanced durability, and lesser space consumption. Memristors are an emerging technology, and are capable of learning and memory, and as such, offer a route to more brain-like computation. The non-linearity of the device makes it attractive for complex brain-like control of robotics, and the device operates at very low power, making memristor-based circuits much more energy efficient than conventional transistor circuitry. 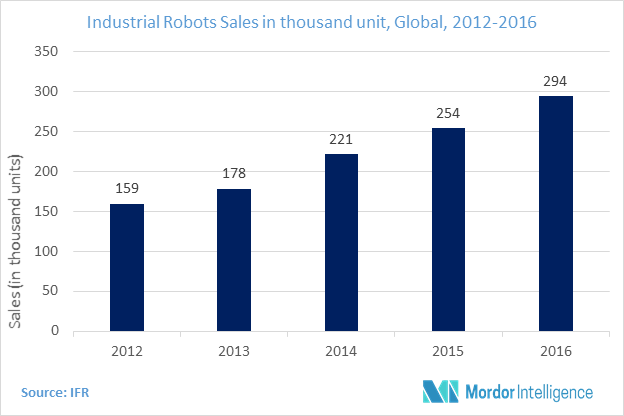 Thus, owing to the increasing demand for industrial robots, the memristors market is poised to register significant growth over the forecast period. The integration of memristors with traditional flexible devices, such as thin-film organic, zinc oxide, or amorphous-Si transistors enable the realization of a new paradigm in computing technology, through lightweight, inexpensive, and flexible electronics. The field of flexible electronics has the potential to revolutionize portable inexpensive electronics, but requires the development of both memory and computational logic components that can be integrated reliably on flexible substrates. The majority of flexible memory devices do not address the needs of a rewritable, low-power flexible memory device. Thus, memristors fill this void, and are elementary circuit elements that could be used to build a new generation of computers, called neuromorphic computers. Further, the emerging trend of transparent electronics is also expected to offer potential opportunities for the introduction of innovative products. Owing to the presence of highly advanced industries in the region, increasing research and development activities, and the presence of a highly informed consumer base compared to other regions, North America accounted for the largest share in the studied market. The region is one of the most prominent contributors to the majority of applications of memristors, including flexible electronics, IoT, and industrial robotics. In 2016, the robit installations in the United States registered a 14% growth, to reach a peak of 31,400 units. In addition, the major companies in the market, such as SanDisk Corporation, Hewlett-Packard, etc., are based in the country, which is another major factor contributing to the region gaining a competitive edge over the rest of the world. Jun 2017 - The US Department of Energy made a significant investment in the next frontier of computing research, by awarding Hewlett Packard Enterprise a research grant to develop a new supercomputer architecture that will process more than one quintillion calculations per second. This drives HPE’s vision for memory-driven computing architecture. Feb 2017 - Panasonic Semiconductor Solutions partnered with United Microelectronics Corporation, for the joint development of mass production process for next-generation 40nm ReRAM. The leading companies in the market are increasingly focusing on developing innovative products with greater memory capacities.